Read excerpt from right to left. 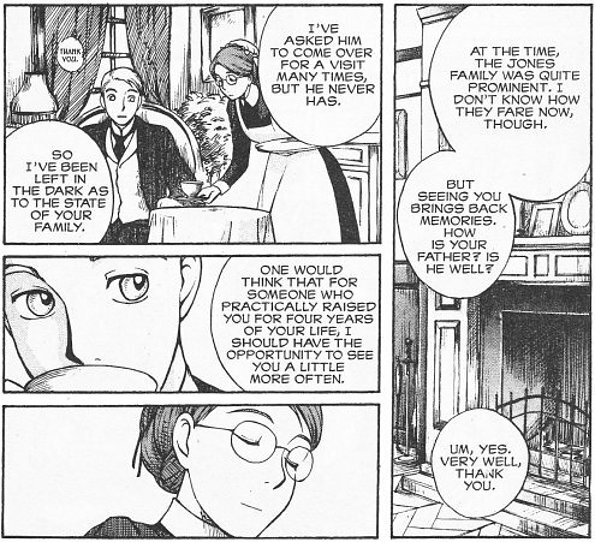 William talks to his former governess (unseen in this sequence), as Emma serves the tea. Setting, gesture and facial expression convey as much story information as do plot and dialogue. ©2002 Kaoru Mori. On a typical English afternoon at the turn of the Twentieth century, a gentried young man named William pays a visit to the woman who used to be his governess. He pauses before knocking on the door, only to have it opened in his face by her live-in housemaid, Emma. Apologies are offered, formalities exchanged, tea is served and a quiet little Victorian romance novel begins. That such a story would be told in serialized graphic-novel format is interesting by itself, and would be further proof of the open-ended possibilities of the format, but there's a further wrinkle to Emma: It's manga, originally serialized in the monthly comics anthology Comics Beam. If you thought that manga was all speedlines and fan service, this story straight out of Masterpiece Theatre may seem a little odd at first. As you read it, the apparently effortless way its author captures the almost ceremonial nuance of a rigid, class-based system may seem odder still. Save for the right-to-left reading structure and the way people's faces are drawn, you'd never think to associate such a tale with Japanese cartooning. Read excerpt from right to left. He might represent Indian novelty, but Hakim can play the Victorian game as well as anyone. Sequence from the first volume of Emma, ©2002 Kaoru Mori. Creator Kaoru Mori, herself still on the shy side of thirty, has clearly done her homework. 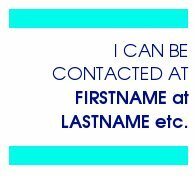 Emma feels authentic because Mori understands that the pomp and circumstance of class structure is best depicted in little moments; the way one serves a cup of tea to a guest with the handle turned towards him, for example, or the way visitors are encouraged to send letters announcing their intention to drop by for a visit. The feeling of reserve and social propriety is enhanced when William's main rival for Emma's affections, an Indian prince named Hakim, drops in on William's life riding an elephant and surrounded by scantily clad serving girls. Hakim is smartly played as experienced in courtship and aware of his own novelty, bringing life and color to the gray, orderly world around him, and his potential threat to whisk Emma away thus has the touch of credibility needed in a romantic foil. Likewise, the desire of William's father for his son to marry upward and maintain the precarious social standing his money and refinement has bought them serves as this series' other principal obstacle to romance, one that will require both the negotiation of and carefully presented opposition to Victorian England's customs and culture. Read excerpt from right to left. Kaoru Mori's enthusiasm for British culture is giddily infectious, in this excerpt from the omake. ©2002 Kaoru Mori. Anyone who's ever watched BBC-produced upper-class dramas will have seen all this before, of course, but it seems fresh somehow in comics form. 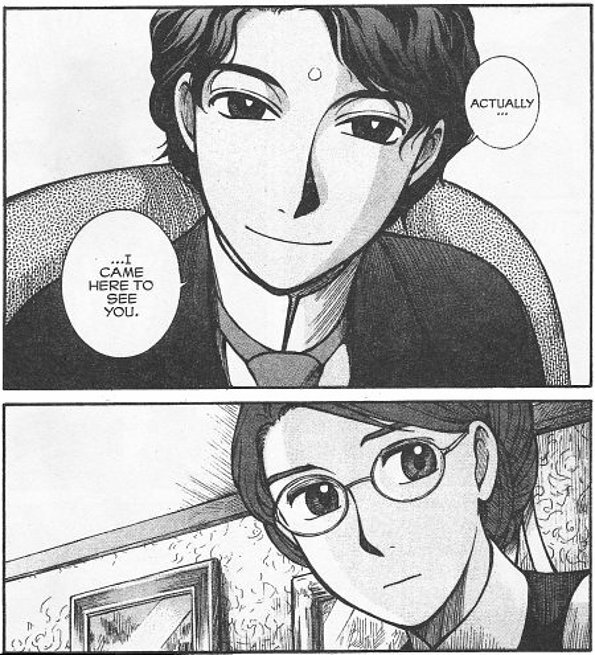 Mori's subdued manga style allows for nuanced changes in gesture and facial expressions to convey a great deal of information, and her enthusiasm for the period is genuine and infectious -- her author's-note omake at the end of this first volume is practically a giddy teenager's love letter to Victorian trappings. "Emma's embarrassed face is... the most important thing of all," her cartoon avatar proclaims with clenched fist. Kaoru Mori may still be a young cartoonist, but that only makes her ability to capture the gentle essence of British drawing-room romance all the more impressive. Emma is a composed, understated delight.